Envelopes are available in most business premises and online through www.swinfordgaa.ie where tickets can be purchased in bundles of 10/25/52 weeks. Next draw is Julians on the 26th September. Draw envelopes are available at €2 each or 3 for €5. 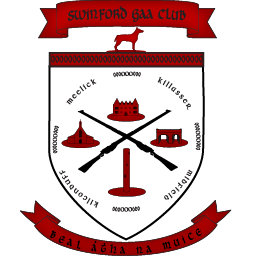 Keep an eye on our Facebook page Swinford GAA and our website www.swinfordgaa.ie for details of fixtures. There will be a club meeting on Friday 29th September at 7pm in Gateway Hotel. Due to some hard work by officers of the club we were able to obtain 147 tickets in total over the past week. 93 tickets were allocated to members of our special €150 Club development draw. These are people who have been supporting this draw and the club for the last few years. 33 were given to our Intermediate/Junior teams. 19 to our various coaches and 1 to our sponsor and 1 to the winner of our 50/50 draw. Unfortunately we would have needed an extra 100+ to satisfy everyone and this was never going to be possible.Not all players, coaches and sponsors obtained tickets. A number of officers gave tickets back to the club. Another update on All Ireland Final Tickets. As previously stated the club will not be able to satisfy anything close to demand. The club received an additional 22 tickets last night. We are in the process of contacting all successful members. If you have not been contacted allready you will be by early tomorrow (Friday) afternoon. If you are not contacted by Friday evening you have been unsuccesful. It will not be possible to get back to everybody who has requested a ticket so if you do not hear from us you have not be successful. Tickets must then be collected and paid for. Presently we are at least ten short to even look after club members, players and coaches. If you have requested a ticket from the club and are successful in obtaining a ticket elsewhere please let us know as this will free up a ticket. The club will be receiving a second allocation on Wednesday evening. It is then hoped to allocate all tickets on Thursday morning and to contact all successful members on Thursday afternoon and Friday. The majority of our tickets are Hill and Nally Terrace tickets and most stand tickets are in the upper level. It will not be possible to get back to everybody who has requested a ticket so if you do not hear from us you have not be successful. If you have requested a ticket from the club and are successful in obtaining a ticket elsewhere please let us know. Priority will be given to our members, players, coaches, sponsors and the supporters of our annual club draw. Outside of this there is no chance of getting a ticket from the club. Here is an update in relation to All Ireland Final Tickets. As stated in previous messages the club will not be able to satisfy anything close to demand. If you are successful in getting a ticket we will contact you to arrange payment and collection. It wll most likely be towards the end of next week. It will not be possible to get back to everybody who has requested a ticket so if you do not hear from us you have not be successful. The club has received an initial allocation of 80 tickets been 40 stand and 40 terrace from the county board. On payment of €2,000 to the county board we were able to buy an additional 40 tickets been 14 stand and 26 terrace. There may be a second allocation next week but right now we have no idea if there will be or how many there will be. When the club closed its list for All Ireland Football Final Tickets last Saturday there were requests in excess of 230 tickets. As you can see from the maths there is going to be a lot of people who are unsuccessful. Priority will be given to our members, players, coaches, sponsors and the supporters of our annual club draw. Outside of this there is no chance of getting a ticket from the club. We will not even be able to satisfy all our members, players, coaches, sponsors etc. There willl be no multiple tickets. Also we are quite restricted with stand tickets so please be understanding. The club closed its list for All Ireland Football Final Tickets at 6pm yesterday (Saturday) with requests in excess of 230 tickets. The Mayo GAA County Board are meeting on Monday evening and it is hoped that the first allocation of tickets will be distributed to the clubs by the weekend. Based on last years allocation Swinford GAA will not be able to satisfy anything close to the demand. A second allocation is usually forwarded to the clubs the week before the final. The amount herein depends on a lot of factors and varies every year. We do not anticpate there being a large second allocation. If you are successful in obtaining a ticket from the club we will contact you to arrange payment and collection. It wll most likely be towards the end of the week of the 11th September. It will not be possible to get back to everybody who has requested a ticket so if you do not hear from us you have not be successful. Priority will be given to our members, players, coaches, sponsors and the supporters of our annual club draw. Outside of this there is no chance of getting a ticket from the club. We will not even be able to satisfy all our members, players, coaches, sponsors etc. Based on previous expierence the club will most likely have to meet a levy from the county board due to the increase in their expenditure. As a result we will be fundraising to meet this additional cost. We would ask you to support our 50/50 draw and we will be drawing ten names for the next two weeks (in addition to the ten names drawn last Tuesday) for a draw on Tuesday 12th for an All Ireland Ticket. We know that everybody wants to be in Croke Park on the 17th September when Cillian O’Connor lifts Sam Maguire but the club is restricted on what it can do with tickets. Right now demand far exceeds supply and the club will not be able to satisfy many requests. Priority will be given to our members, players, coaches, sponsors and the supporters of our annual club draw. Outside of this there is very little chance of getting a ticket from the club. What we will be allocated will just not stretch that far. There are no juvenile tickets and we will not be able to facilitate requests for multiple tickets. Based on previous years the majority of the club tickets will be Hill and Nally Terrace. If you are fortunate to obtain a ticket elsewhere and you have requested a ticket from the club please inform us so that we can remove your name from our list. Your assistance is appreciated. There will be huge demand for tickets for the forthcoming All Ireland Football Final. We do not know what allocation we will receive from the county board but based on previous finals the club will not be able to meet the demand and will not come anywhere near fulfiling all requests. Any requests after this deadline will not be accepted. Priority will be given to our members, players, coaches, sponsors and the supporters of our annual club draw. Please seek out tickets throughout the country and enter as many competitions as you can. The club will do its best and we ask for your co-operation and patience. This weeks draw was held in Gateway Hotel and David Shiel of meelick won €880. Envelopes are available in most business premises and online through www.swinfordgaa.ie where tickets can be purchased in bundles of 10/25/52 weeks. Next draw is Moores on the 15th August. Draw envelopes are available at €2 each or 3 for €5. Swinford GAA Club will be ordering tickets for the upcoming semi final of Mayo –v- Kerry on Sunday 20th of August. Please have your ticket order e-mailed to secretary.swinford.mayo@gaa.ie by no later than 3pm on Friday 11th August. No order for tickets will be taken after that time and only one order will be submitted from Swinford GAA Club. Family tickets will be together but please note that the Club cannot guarantee that all other tickets will be seated together. Tickets will be distributed on Friday 18th. Group pass- Juveniles U-16 €3 each (you are permitted to bring 1 adult free with every ten Juveniles) any additional adults pay full price for their tickets. Club Pass for adults- €10. Max 50 tickets per club, one application only per club. Both Group/Club Pass will be subject to availability. This weeks draw was held in Bolands and Maria Groarke of Derryronane won €793. Envelopes are available in most business premises and online through www.swinfordgaa.ie where tickets can be purchased in bundles of 10/25/52 weeks. Next draw is in Julians Bar on the 4th October. Draw envelopes are available at 3 for €5. The winner of the All Ireland Final Ticket was Sarah Lavin of Railway Terrace, Swinford. The club received an allocation of tickets on Sunday night from the county board, unfortunately demand is running at twice the amount of tickets. We are hoping that we will get a second allocation on Thursday. Recipients of tickets will be contacted with details of where to collect their ticket. I’m afraid it will not be possible to give out multiple tickets. As with the drawn match the majority of tickets are either Hill16 or Nally terrace. The club did not take up any juvenile tickets as the offer was only ten tickets and would have been at the expense of adult tickets. Swinford Parke KC Minor team defeated Bonniconlon in terrible conditions on Friday evening in Bekan by 2-5 to 0-2 to qualify for the county semi final. 36 hours later they had to go out and play Belmullet at their home and this was too much and they were beaten 2-18 to 0-2. There is no doubt the fixture list and player wellfare has to be looked at for the coming year. Well done to all the lads from both clubs and to the management. As anticipated demand has far exceeded supply. Our allocation from the county board is only 22 tickets more than for last weekends drawn game. Again well over half our allocation will be terrace tickets. Demand for the replay is well in excess of the drawn game. The club has been offered 10 juvenile tickets that would be in lieu of 10 adult tickets and therefore would not change our total tickets. Due to this limited number the club has decided not to avail of the option for juvenile tickets. Closing date for requests is Saturday 24th September 6pm. No late requests will be entertained. Priority will be given to members of our annual Club Draw, coaches, players and sponsors. At this stage unless further allocations are made we will be unable to satisfy any other requests. In addition it will not be possible to meet requests for multiple tickets. Please continue to search the country for tickets and ask friends/colleagues/relations..….If you receive tickets elsewhere please advise the club so that we can remove your name from our list. Successful applicants will be contacted in relation to collection of tickets. Remember there is a ticket to be won in the upcoming 50/50 draw in Bolands next Tuesday.